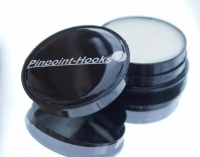 Welcome to Pinpoint-Hooks.de - your specialist for hand-sharpened hooks! With the introduction of NEXGEN technology Pinpoint Hooks acchieved a quantum leap in the production hand sharpened hook. Was the process of sharpening previously uneconomical and time consuming, we are now able to reduce the manufacturing time of a hook on our machine to a minimum while at the same time an unprecedented level of quality can be achieved. As a result, we are able to provide our customers with hooks in an unprecedented sharpness and for an absolutely reasonable price. Each hook regardless of manufacturer or model, is sharpened by hand under the microscope and brought to a level that can only be described with the word "perfection".